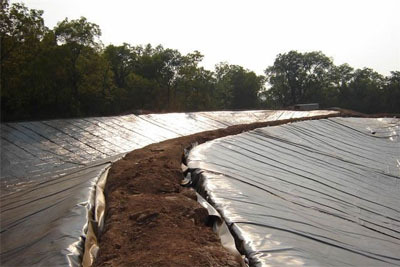 PP geomembrane is manufactured without the reinforcing scrim found in supported styles, allowing them increased flexibility – ideal membrane solutions for detail work such as attaching to structures or creating corners. In addition to flexibility PP has other outstanding properties such as outstanding resistance to low temperatures and high UV resistance making PP ideal for exposed ponds. PP can be installed and welded in the coldest conditions (as low as -50C) and is a perfect choice for water and water based effluent storage applications where the liner will be left exposed, delivering many years of reliable containment.